It’s an exciting time to be a concert-goer in the Milwaukee area these days! With the recent completion of a brand new arena (Fiserv Forum), for the first time in decades there is a legitimate reason for big name artists to pencil in southeastern Wisconsin on their tour schedules. The Forum has seen some famous bands open the place up: Maroon 5 and The Killers kicked things off earlier this month. But truly it was last Friday’s performer who was attracting all the attention, and his concert marked the beginning of Milwaukee’s “Big City” renaissance. That man was Justin Timberlake. 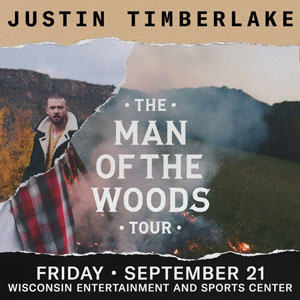 Timberlake had not graced a Milwaukee stage since 2003, and even then he didn’t perform as a singles act. So there was a lot of built up anticipation surrounding this concert the last few months, and with anticipation comes expectations. Timberlake remains one of the most popular male artists in the world these days, even after a series of underwhelming albums (To be fair, I did give Man of the Woods a B). But let’s be honest, nobody in attendance on Friday night particularly cares about those narratives. And Timberlake gave them no reason to regret that decision: the show was consistently entertaining and chock full of the man’s biggest hits. Admittedly, I’m not the biggest Justin Timberlake fan in the world; thanks to my wife I’ve become familiar with his discography and have listened to all the albums he has released to this point, but to my ears it sounded like Timberlake delivered on all the songs he was expected to. Two of his absolute best collaborations, “LoveStoned” and “Sexyback” came almost immediately towards the front end of the show, and while his 1-2 opener of “Filthy” and “Midnight Summer Jam” got the crowd up, it was truly those latter two that got them grooving. While Timberlake has definitely made some good music since Futuresex/LoveSounds, many think that album was his pinnacle of creating modern dance music, a route he has somewhat shied away from in the years since. Justin Timberlake is no longer the young up and coming artist, hungry to make it big. He’s the establishment now (which isn’t a bad thing people), and thus the concert on the whole encapsulated his innate sense of how to entertain in the most professional manner. No huge risks, no sense of “Oh my gosh, I will never see THAT again”, but expecting that from an artist like Timberlake would be a mistake. He doesn’t need to do that anymore, instead he understands that the fans are there to see the hits, and enjoy the show from top to bottom. I think sometimes he thought his personality could carry the day a little more than it actually was capable of, but the man was singing and dancing for two hours and change and didn’t let up the entire time. When it comes to an entertainer, you could do a hell of a lot worse than Timberlake. That, in fact, brings up something interesting that came up in a discussion with my wife after the show. We were discussing how Timberlake chose to close with the show with arguably his biggest hit, “Can’t Stop The Feeling” off the Trolls soundtrack. Now, I happen to enjoy that song, and felt it worked well as a closing number in the spirit of unity and just unbridled enthusiasm...but my wife had a decidedly opposite reaction. If I were to sum it up in one word, it would have been...”UGH.” As I probed her reaction a little deeper, her feeling was that as the last song, it just wasn’t the right choice for who Timberlake has been throughout his career. And it is interesting that after a career of creating dance music that is inherently sexual and suggestive, the song that closed everything up was an inoffensive, simple little pop song. Timberlake can’t help that it became the hit it did, and that soccer moms around the nation now love JT for that singular performance, but it presented a very different Timberlake from the one who earlier had no problems cursing, and taking shots along with the audience. The ability for crowdwork is something that not everyone is blessed with; it can come off as incredibly insincere and turn of a crowd in the drop of a hat. Timberlake threw out the usual, “Milwaukee it’s great to be here!” and “Pretty crazy to come to Milwaukee on a Friday night,” but there was one moment that was unique to this particular performance, and that goes a long way. A fan knew of Timberlake’s Green Bay Packers fandom, and brought along two Brett Favre jerseys, one for JT and one for his young son. Timberlake was genuinely pleased to receive the gift, and one could hear the excitement about getting his son to don the #4. That’s a moment that isn’t going to happen anywhere else on the tour, so it made the Milwaukee show just that little more special. There was an interesting dichotomy present on the stage: in some ways it was one of the more technically proficient shows I’ve seen, but given the somewhat confusing title and promotion for Man Of The Woods, there were also attempts to, shall we say, rustic up the joint? Fake trees, fake grass, and at one point during the evening, an “impromptu” campfire singalong....complete with acoustic guitars, a roaring campfire and Super 8 camera to broadcast the joy to the masses. I’m not going to lie, it did reek of insincerity. This was the equivalent of the classic rock artist taking time in the middle of the set to play “some new stuff,” followed by a massive exodus to the bathroom. That being said, I will give Timberlake some credit in this manner: he allowed his backup singers each to get a solo moment to shine. That’s a nice touch to be sure, but let’s face it, everyone was there to see JT. There’s a newer trend going around live shows this day, and it’s one I am definitely in favor of: more open and accessible stage designs. Timberlake and his band could literally walk around the entire enter center of the arena, so they were able to provide better views, and give some love to those sections that in the old days would have been straining to catch a glimpse. Technology has advanced enough where movement in all aspects of the production is more than possible, it’s encouraged. And for the short attention span fans in attendance (like this author...), there was plenty of fog, bright lights, and lasers swooping around the arena to keep us enraptured. The best judge of a live show is asking yourself the question, “Would I go see him/her/them again?” It’s not exactly cheap to go to live shows these days, so your choices become even more critical as to whom you are planning on seeing. And truth be told, even as a slightly more than casual fan, my answer to that question would definitely be yes. I’d have made a few tweaks to the show itself, but if you say, “Jeff, would you watch Timberlake again?” I would not be shaking my head. The man puts on a damn good show.